Hilton East Midlands Airport HotelCentrally located to three major road networks, the Hilton East Midlands is an ideal location to stay when visiting any of your chosen attractions. 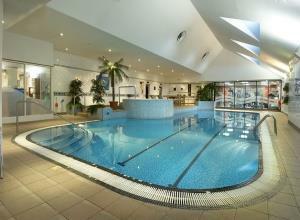 Our Livingwell health club has a 16 metre indoor heated pool along with a spa pool which is included in your stay, along with a gym sauna and steam room. PLEASE NOTE – Our health club does offer limited evening opening hours for children Monday-Thursday (please call our Livingwell health Club direct on 01509 674166 for additional information). If an adult purchases dinner in our Whisk & Ladle Bar & Kitchen one child 5 and under eats for free from the hotel's children's menu. Children 6-12 can eat from the children's menu for £10.00. Children over 12 will be charged depending on the menu chosen..
Our family accommodation is suitable for up to a maximum of 2 adults and 2 children and consists of either a double bed or two single beds along with a sofa bed and a small rollaway bed (the hotel cannot guarantee that double beds will be allocated requests are subject to availability). The hotel can also provide highchairs and cots (these cannot be extra to the 4 beds already in the room as the maximum amount of beds we can have in our family rooms is 4) at no extra charge. Centrally located to three major road networks, the Hilton East Midlands is an ideal location to stay when visiting any of your chosen attractions. The hotel operates chargeable car parking at £5 per night for residents. If staying on the Stay Play and Explore Family Fun package then parking charges are included in the package. Children welcome from any age. Exit the M1 at Junction 24 and follow the signs for the A50 Stoke/Derby. The hotel is situated on the right hand side of the dual carriageway (Brown Hotel Signs).